Characteristics: Flattened body and 6 saw-like teeth on each side of prothorax. Wings are present and developed, but this insect is not observed flying. Mature larva is long and fairly smooth, and the antennae have 3 segments (2nd segment the longest, 3rd segment very small). Size: Approximately 1/8 of an inch long. Sawtoothed grain beetles have a flat body and are brown in color; adults grow to be about 1/10-1/8 of an inch in length. These beetles do not fly and are not attracted to light. They have six distinctive “saw-like” projections coming off the side of the segment (prothorax) located just behind their head. Why Do I Have A Sawtoothed Grain Beetle Problem? In simplest terms, food is home for these stored product pests. Sawtoothed grain beetles are found in a variety of foodstuffs including grains, cereals, bread, pasta products, dried meat and fruit, nuts, sugar, chocolate and other candy, tobacco products and drugs. They will lay their shiny white eggs in small crevices in food materials. You may have these pests in your home or business if they are living in stored products that you purchased from the grocery store. What Are The Signs Of A Sawtoothed Grain Beetle Infestation? 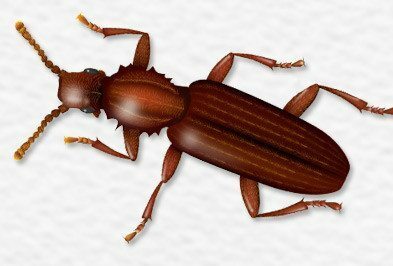 Property owners and managers are usually alerted to the fact that they are having problems with sawtoothed grain beetles by finding the adults crawling around on surfaces, or on food storage shelves. Other signs may include finding them inside of dry goods or by finding holes in food packaging. What Kind Of Threat Do Sawtoothed Grain Beetles Pose? Sawtoothed grain beetles are commonly referred to as nuisance pests because they pose no real health risks and are not known to transmit any diseases to humans. However, if sawtoothed grain beetles gain access to kitchens they may contaminate your food sources which you will then have to discard- costing you both time and money. Also, sawtoothed grain beetles can create the proper conditions for mold growth in the areas that they are found infesting. Sawtoothed grain beetles are often responsible for the destruction of stored products in homes and in grocery stores. How Do I Control Sawtoothed Grain Beetles? If sawtoothed grain beetles are already a problem in your home or business, contacting Holder’s Pest Solutions is the ideal solution. Let our pest management professionals accurately identify your pest and devise a treatment that works best for you. For more information on stored product pest control in Houston, contact Holder’s Pest Solutions today! How Do I Prevent A Sawtoothed Grain Beetle Problem? Problems with sawtoothed grain beetles often occur when homeowners unknowingly bring them into their home through already infested products that they purchase from the store. To help prevent a sawtoothed grain beetle problem in your home you should thoroughly inspect packaging for holes, rips and tears before purchasing it. Inside your home make sure that your kitchen and other storage areas are properly ventilated to prevent moisture build up; make sure to thoroughly wipe, down and dust your kitchen counters, cabinets, and pantry areas. It is also a good idea to store dry goods in sealed plastic or glass containers instead of in their original packaging.